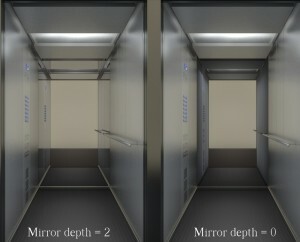 Long story: this is a case of extreme glossiness you don’t get every day in a project, but there it was: I was working on an elevator interior and had a lot of glossy reflections recreating brushed stainless steel + a mirror wall = all that was reflected in the mirror was wrong because the blur was gone, all reflections were clear. So BI doesn’t reflect the glossiness. I understand this is not exactly a bug, more of a BI limitation and have no idea if it will be improved. As Cycles is getting all the attention now, BI might not get many improvements soon or ever. But until I find out whether Cycles will work for my projects as nicely as BI does, I try to find fixes and workarounds…. So what worked in this particular project – though I’m not sure it will cover every variation of this problem – was setting the depth to zero in the mirror material settings. So this killed the secondary reflection completely which is not ideal; the stainless steel in the reflection does not look too great, but at least the weirdness of having unexpected reflections showing up disappeared. I also separated the mirror in a render layer and used the compositor to fade it a bit with a pinch of blur but I’m still not very good with compositor tricks so probably this could be done better. Have you stumbled on this before? Quite a serious limitation! It’s the same in 2.49… but in Yafaray it works correctly. The only workaround I can think of for 2.5+ is blurring an object-masked node, I guess it would be quite messy, haven’t tried it. I hope you arrive at a good solution for this project.